Message: all my dogs wear these plastic tags, they are brilliant. having to replace one because dora the springer lost her collar running wild in scotland!!!!! 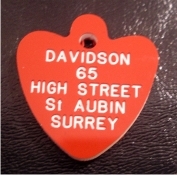 Message: THESE TAGS ARE EXCELLENT FOR CATS AS THEY ARE LIGHT WEIGHT, BRIGHT AND COLOURFUL. Message: LOVELY AND LIGHT, CLEAR AND COLOURFUL. MY CATS ARE PROUD TO WEAR THEM.